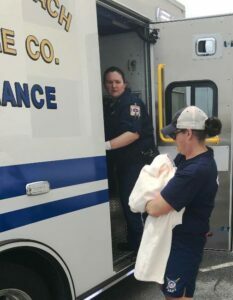 A 19-year-old woman successfully gave birth to a baby girl at the Hyatt Place parking garage early Tuesday afternoon. Sgt. Clifford Dempsey, police spokesman, says officers responded to the Hyatt after a worker discovered the woman who had just gone into labor around 12:20 p.m. The mother reportedly did not know she was pregnant although she had experienced recent stomach pains. When officers arrived, Sgt. Dempsey said the mother was walking and holding the baby. She was placed in a Dewey Beach police vehicle until Dewey Beach Patrol EMTs arrived. They transferred her to a Rehoboth Beach ambulance with Sussex County paramedics on board. The mother and daughter were taken to Beebe Hospital and were last reported in good condition.